As scenic as Ireland was at times, I was happy to now be in Wales. After a week of traveling around Ireland with my friends in a rental car, I had taken the ferry from Dublin, Ireland to Holyhead, Wales (in the United Kingdom) and I had three short days to get myself, my bicycle and all of my earthly possessions to the nearby city of Liverpool before taking a train to Henley-on-Thames (near London) and staying with my family friends, Jill and Shaun, who were expecting me. The ferry ride to Holyhead was an easy (but expensive) one. When I landed in Holyhead (at the very top of Holy Island), I immediately went to the nearby Lidl supermarket and loaded up on food and water. Then I got back on my bike and started cycling south. The goal for the day was to cover as much ground as possible so that for the following two days I wouldn’t have to rush to make it to Liverpool. I’ve never been to Wales before, so I wasn’t sure what to expect, but I liked it there almost immediately. 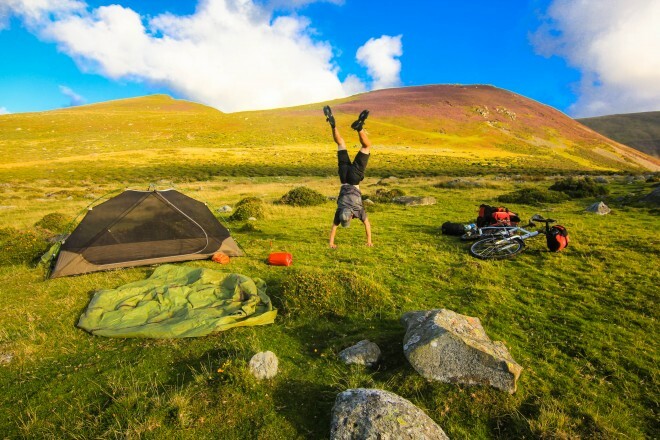 Compared to the crowded, narrow streets or Ireland, Wales felt wide open and relaxed. There were far fewer cars on the road and the streets went in much straighter lines most of the time. I could breathe again! After just a short while I reached Britannia Bridge and then cycled across the nearby Menai Bridge that takes you from Anglesey Island to mainland Wales and the city of Bangor. Leaving Bangor was when the real bike touring fun began. Rather than cycle along the coastline, which is the recommended cycling route, I chose to go uphill into a steep, mountainous area not even mapped by Google Maps. It was here, near Aber Falls, that I ran into a Shepard escorting a few dozen sheep down the roadside. I pulled by bike to the side of the road, letting the man walk his few sheep down the road. Before I knew it though, there were several hundred sheep in front of me and they just kept coming. I asked the Shepard how many sheep were coming down the hill (because I couldn’t see up the road – a bunch of trees and bushes were blocking my view) and I was informed that there were a good 2,000+ sheep being escorted down the hillside. When, at first, the man told me that there were 2,000+ sheep in the area, I didn’t believe him because at the time I was only looking at about 250 sheep. But then, right during the middle of my conversation with the man, the roadside seemed to explode with sheep. Every spare inch of the road was covered in sheep. There were literally thousands of sheep running past me and my bicycle. After more than a half hour, the sheep had all been ushered past and I was finally free to continue up the mountain. It was starting to get dark now and I still had no idea where I would be sleeping that night, or if any suitable campsite could be found on this steep mountain road. And the road to the top of the mountain was indeed very steep. It didn’t take me long to get to the top however. And when I did eventually make it to the top, I was treated to some good weather, some spectacular views, and (best of all) I had the entire mountain to myself. There wasn’t another person in sight! I found a spot just a hundred feet or so off the gravel road at the top of the hill where I could set up my tent for the night and then I got to work setting up my camp for the evening. This spot, high on the mountain above Bangor, Wales was seriously one of the best campsites I have had in my entire life. It is moments like this that make me realize why I love bicycle touring! The photo below shows the view I had from the front door of my tent. If I had had the time, I would have stayed up there on the top of the mountain for several days. It was wonderful! After a good night of sleep (and I was tired after waking up so early that morning to take the ferry from Ireland to Wales), I packed up my bike and, rather than cycling down the mountain and back to the main road, continued climbing upward into the hills and east toward the town of Ty’n y Groes. The road leading away from my campsite was not a good one. It was a gravel road, with several steep areas where I was forced to push the bike uphill. But this is actually the type of bicycle touring that I like most – difficult, technical terrain with no cars or people to contend with. I could have gone on like that for days on end and been very, very happy. Following the power lines that were stretched across the mountain top, I simply followed the road as it led east. Crossing over several small streams along the way, I saw dozens of sheep and horses throughout the day and didn’t see another person until sometime before lunchtime. When I finally reached the top of the hill, I prepped my brakes for a long downhill descent. After nearly four months of bike travel, my brake pads were barely capable of slowing (let alone stopping) my heavily loaded bicycle, but I pressed on… cautiously. At one point where the road narrowed to such a degree that only one vehicle could squeeze through, I prepared myself to go around a sharp left-hand turn, when all of a sudden a large red van pulled out from behind the corner. He was headed right at me! I slammed on my brakes and realized they would be unable to stop me in time, so I turned the bike sharply to my left and purposely crashed my front wheel into a large raspberry bush on my left-hand side. My arms and legs were almost instantly covered in blood. Raspberry thorns dug into my flesh and scratched dozens of long red lines into my arms and legs. The driver of the red van had seen me by this time, and he too had slammed on his brakes, stopping just an inch or two from me. If I had not driven my bike into the bushes at my side, I would have surely been thrown into the windshield of this large van. The rest of the day went largely undocumented. After making it back to the main road and the city of Conwy, I realized just how far I still had to go. I positioned my bike along the main road heading toward Liverpool (the A55), put my head down and started pedaling. For what seemed like several hours I cycled along the shoreline while passing beaches, golf courses, ice cream stands, carnivals and hundreds of mobile homes. I didn’t stop cycling, however, until I was in the tiny town of Mostyn. From there, I cycled uphill and pushed my bike down a long horse trail to a flat and secluded area where I was able to set up my tent for the night. The next morning I woke up early, packed everything up and only then realized that one of the bolts holding my rear rack in place had snapped off and was now stuck in my bicycle’s frame. Luckily, I was able to simply move the rear rack down a hole, put in a new bolt and continue on my way. I would have to get that broken bolt out of the frame at some other time! The ride from Mostyn to the ferry crossing at Birkenhead was a good one, but not especially memorable. I paid about 3.50 pounds to cross the ferry from Birkenhead to Liverpool and then had a few hours to kill before I arrived at the home of my Warmshowers.org host in nearby Bootle. I killed that time by grabbing a SUBWAY sandwich and eating it in a park while listening to podcasts on my smartphone and reading a chapter from my book. While I was sitting in the park, I looked up suddenly and saw two young, teenage boys down on the grass in front of me. I thought the boys were just playfully wrestling at first, but then I realized that the larger 15+ year old boy was holding the smaller 13+ year old boy on the ground and trying to choke him out. After 15 or so seconds passed and I could see the smaller boy being bent further and further backward, I decided to step in. Both boys jumped up at this point and I could tell they were both okay… if a little red in the face. I gave them both the “evil eye” and didn’t say another word. Then I calmly turned around and walked back to my bike. The bigger boy soon ran off and the little boy stumbled to his feet. Now with only 15 minutes or so to get to my WarmShowers host on time, I cycled down a nearby canal bike path and then pushed my bicycle up to the address I had been given by Ivan, the young man who would be hosting me for the night. Just as I looked up from my bike and pointed myself in the direction of his home, Ivan came riding up in front of me on his bicycle – his right hand extended. I shook his hand and then he walked me inside his home where I met his girlfriend (Kotryna) and a friend of theirs from the nearby Isle of Man. Ivan and Kotryna told me that they were both from Lithuania and they were interested to hear what I though of their country after having cycled across it just a couple months prior. With our introductions out of the way… and with such beautiful weather outside, Ivan suggested that we all go on a bike ride to a nearby beach. I was kinda dirty and tired from a long day of bike touring, but I was up for some more cycling. So we all jumped on our bikes, took a short ride north on the train, and then cycled through the dark to a nearby beach. The next morning I woke just in time to see Ivan leave for work (He works at a pawn shop). I stayed a little while longer and spoke to Kotryna about her plans for getting a job in Liverpool and then I said goodbye. Sometime around noon, I boarded a train that took me to London. I then took the subway to London Paddington station and then took another train from there to the city of Twyford. From there I pedaled my bicycle about 8 miles to the nearby city of Henley-on-Thames and was so very pleased when I reached the small bridge that acts as the entry way to the small riverside city. In the photo below you can see (on the very top) a photo I took in Henley-on-Thames during my European bike tour in 2012. On the bottom you can see that same bicycle in the same exact spot, but this photo was taken on September 4, 2012 – more than two years later. 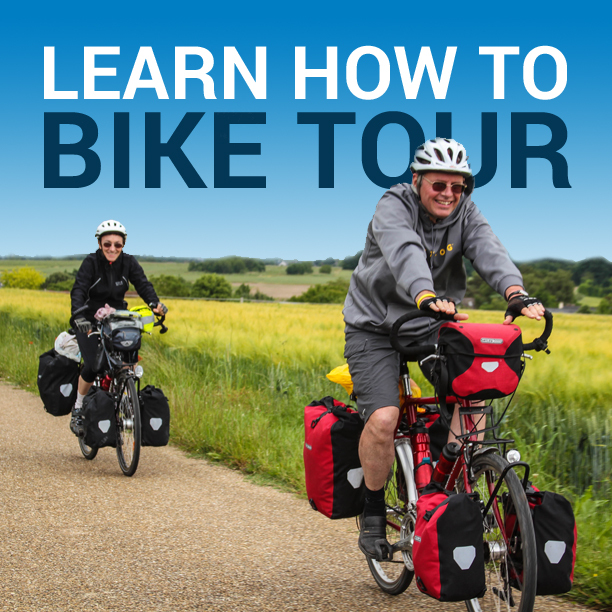 Same location, different bike tours! In Henley-on-Thames I spent two nights with Jill and Shaun (friends of my family who I also stayed with for two nights during my bike tour in 2012). While staying with Jill and Shaun, they took me out to eat some Mexican food and the following day took me to nearby Blenheim Palace – home to the 11th Duke and Duchess of Marlborough and birthplace of Sir Winston Churchill. We took a tour of the house and the gardens surrounding the property. Then we returned to Jill and Shaun’s house in the evening where they spoiled me with a delicious home-cooked meal. They washed my clothes, took me to the local bike shop, and generally helped me prepare for my flight to Romania. That’s right Romania! While my original plan was to spend two full months cycling around Ireland and the UK, I quickly changed plans after arriving in Ireland. It was cold, wet and miserable and I wasn’t sure if, after four months on the road, I could handle another month of cycling in those countries (especially when I don’t really like it there (That’s right – I’m not a major fan of cycling in Ireland or the United Kingdom (I’ll have to explain why in a future blog post perhaps.))). So I decided that it was time for a rest. Rather than cycle around Scotland for a month in the cold and rain (like I had planned), I would fly to Romania, rent an apartment there for the entire month, and do some much-needed computer work. It would be warmer, a whole lot cheaper, I could get some work done, and I could get my energy back. Energy I would need for the final leg of my 2014 bike tour – a one-month-long bicycle tour around the island nation of Taiwan. Stay tuned for more information on that trip! I leave for Taiwan on October 14, 2014. More details coming soon! This entry was posted in Bicycle Touring Pro Articles, Darren Alff's Bike Tour Blog, Europe, Locations, Photos, United Kingdom and tagged bicycle touring in the united kingdom, cycling in the uk, cycling in wales, holyhead wales, liverpool, liverpool england, uk bike routes, united kingdom bicycle routes, wales. You missed out on the most beautiful part of the UK man!.. Scotland. If you get the chance to return one day i’d recommend going between April-September when the weather isn’t too bad. Yeah. My original plan was to go to Scotland, but after 1 month of constant cold and rainy weather in Ireland and the UK, I decided to abandon my Scotland plans and go to Romania instead. I’m glad I made that decision, but now I need to make another trip back to Scotland at some point in the future. I will second the recommendation of returning to Scotland, the West coast in particular is one of the most incredible places i have ever been.